I've been planning to take a closer look at Xamarin products for quite some time now, I just needed something to actually get me started. 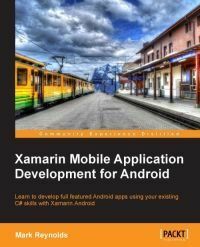 When I got the offer to review Xamarin Mobile Application Development for Android written by Mark Reynolds and published by Packt publishing, I didn't think much. It was a great opportunity to actually try out Xamarin.Android. I really liked how the book started out with an introduction to the Android platform and some technical insight into the architecture of Xamarin.Android and its integration with the platform. It gave me a nice foundation to build upon during the remainder of the book. The author decided to organize the chapters around a single application, building it from start to finish, while gradually incorporating new features. I found this approach engaging and easy to follow by building that same application while reading. For a book targeting existing C# developers, it started a bit too slow in my opinion, spending too much time on the basics if IDE. Even though Xamarin Studio is being used, it is similar enough to Visual Studio and shouldn't require much attention. Once that was out of the way, the chapters nicely focused on individual Android specifics, such as building the UI, handling the navigation and working with sensors. These subjects are what .NET developers really need to transition to the new platform and the book does a good job at it. The book concludes with some basics about application deployment; again very useful for those, not already familiar with the platform. There were a couple of topics I missed in the book. In particular more information about testing the applications on actual devices and some guidance on how to best take advantage of existing resources for Java Android development when working in Xamarin. It would also be very useful to include some recommended development practices for reusing code between platforms and handling Android specifics. Nevertheless the book is a great first step into the world of Xamarin.Android for a seasoned .NET C# developer with no previous development experience on Android. It's definitely enough to get you started and makes it much easier to decide whether this is the right way to build Android applications or not. It certainly convinced me to use Xamarin.Android for my first Android application. The book is available on Amazon and sold directly by the publisher.